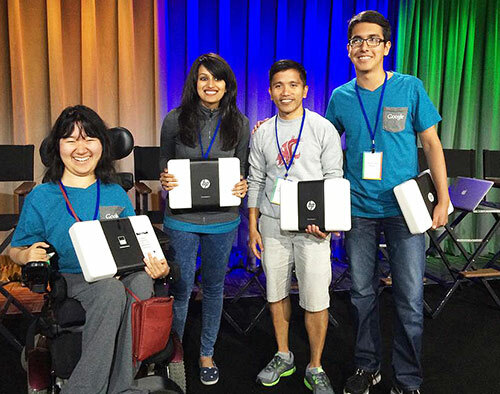 PULLMAN, Wash. – Computer science doctoral student Gabriel V. de la Cruz recently attended the 2014 Google Scholars Retreat, where his team won the Engineer’s Choice award in the Google Scholars Hackathon. De la Cruz, second from right, with his winning Google hackathon team. De la Cruz’s team, called Illuminati, built a Web application for computer science courses to allow professors to evaluate their student’s code without putting them on the spot. The concept is similar to that of using clickers or other student response systems, but allows professors to see exactly how their students are working with code. Find an example at http://illuminati-gscholar.appspot.com. The team included undergraduate students from Harvard University, University of Texas Austin and University of California Los Angeles. The annual retreat at the Googleplex in Mountain View, Calif., is offered to all recipients of Google scholarships. De la Cruz received the Google Student Veterans of America Scholarship. He earned his B.S. in information technology at the Cebu Institute of Technology in the Philippines in 2005 and served in the U.S. Navy 2005-12. At WSU, de la Cruz is advised by Matthew Taylor and is interested in researching reinforcement learning, transfer learning and intelligent multi-agent systems as they apply to robotics.